Learn how to procure, maintain the Microbial Cultures by sub culturing and destruction of microbial cultures. 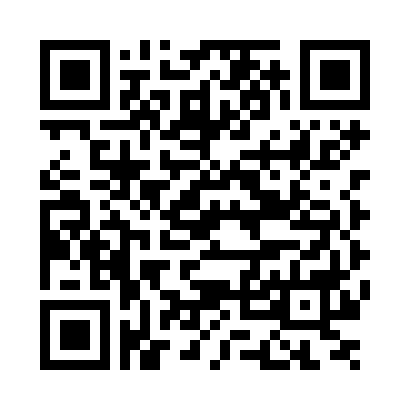 4.1.1 Send the indent copy to Purchase department for further action. Purchase department must arrange the cultures as per the specification is given in indent copy, from approved source with their authentic certificate. 4.1.3 Following is the list of standard culture with ATCC Nos. and their equivalent number of other agencies. 4.1.4 After receipt, record all the details and labeled as mother culture suitably batch numbered and store at 2 – 8°C. 4.2.1 Operate LAF as per SOP for operating instruction for LAF. 4.2.2 Wipe out the outside surface of the culture slant tubes / lyophilized ampoules with cotton soaked with 70% IPA. 4.2.3 Get fresh slant/stab tube and wipe out outside surface of the tube with cotton wool soaked in 70% IPA. 4.2.4 Hold on the extreme end and heat the nichrome wire loop on the reducing flame till red-hot. 4.2.5 Allow to cool the wire loop and slowly open the cotton plug of old culture tube and gentle warm the mouth of the tube. 4.2.6 Pick up the smear/growth with the help of loop after removing cotton plug of the slant tube. 4.2.7 Hold the nichrome wire loop with smear/culture growth, plug the culture slant tube, and put aside the old slant culture. 4.2.8 Open the fresh slant tube, warm the mouth of the tube holding in other hand and carefully transfer the culture that is held on the loop. 4.2.9 Spread the culture spirally on the surface of the slant, warm the mouth of slant and plug it. 4.3.1 If the mother culture is lyophilized, score the middle of the ampoule with an ampoule cutter. 4.3.2 Disinfect the ampoule with sterile 70% v/v IPA solution which is moistened with lint free cotton. 4.3.3 Wrap the sterile cotton cloth around the ampoule and break it carefully. 4.3.4 Aseptically add about 0.2 ml of sterile saline solution with the help of micropipette and mix well. 4.3.6 If the culture is in vegetative form (slant culture), check the purity of the cultures by staining method and record the observation in format. 4.3.7 If the cultures are not showing their physical characteristic, discard the culture as per SOP for destruction of microbial wastes. 4.3.8 After ensuring the purity of mother culture, prepare three master culture of each culture by transferring a loop full suspension from mother culture to fresh slant, and treat as a MC1, MC2 and MC3. 4.3.9 Incubate both the tubes at specified temperature and period, as indicated in Table – 1 and observe the growth after incubation. 4.3.12 If the culture showing their physical characteristics as stated in Table No: 1, transfer a loopful growth from MC1 to a fresh seven set of slant and treat as M1, M2, M3, M4, M5, M6 and M7 respectively. 4.3.13 Incubate the all the slant at specified temperature and period, and assign batch No. I.e. MC1/M1, MC1/M2, MC1/M3 up to MC1/M7. 4.3.14 After incubation observe the growth and label the culture as per sample given in Annex-1, store the culture at 2 – 8°C for their specific period. 4.3.15 Use the prepared culture as per schematic diagram specified in annexure-1. 4.3.16 For the 1st month, 2nd month, 3rd month, 4th month, 5th month and 6th month use M1, M2, M3, M4, M5 and M6 respectively for preparation of weekly cultures. If one of the above culture get contaminated use M7 culture. 4.3.17 Transfer a loopful growth from Monthly Cultures i.e. M1, M2, M3, M4, M5, & M6 after ensuring the purity of cultures to a five fresh slant and treat as a W1, W2, W3 W4 and W5. Assign the batch number i.e. MC1/M1/W1, MC1/M1/W2, MC1/M1/W3, MC1/M1/W4 and MC1/M1/W5. 4.3.18 After incubation observe the growth and label the culture as per sample given in Annex-1, store the culture at 2 – 8°C for their specific period. 4.3.19 For 1st, 2nd, 3rd and 4th Week of every month use W1, W2, W3 and W4 cultures respectively. If one of the above culture get contaminated use W5 culture. Prepare daily working cultures after ensuring the purity of Weekly culture by transferring a loopful growth to a fresh four slants and treat as a D1, D2, D3 and D4. Assign batch number i.e. MC1/M1/W1/D1 to MC1/M1/W1/D4. 4.3.20 Incubate all the slant at specified temperature and period (Table –1), observe the growth and labeled properly. Store the culture at 2 – 8°C for their specific period. 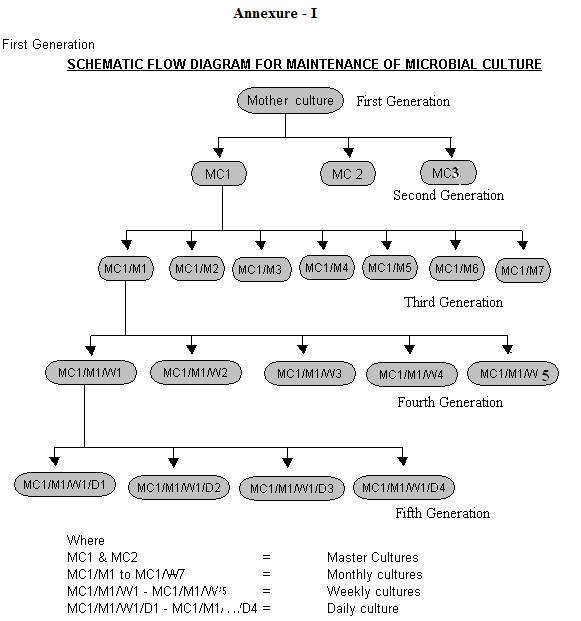 4.4.1 For Daily Microbiological Analysis use only Daily Working Culture. Use one D1 culture for two days, D2 for next two days like this, D3 and D4 respectively. 4.4.2 After completion of work discard the culture slant by the addition of disinfectant solution for 30 minutes and then autoclave at 121°C / 15 psi Pressure for 30 minutes and record the destruction details. 5.1 After transferring the culture, always return the cotton plug or caps to the correct tubes. 5.2 Never forget to sterilize the inoculating loop before returning it to the holder. 5.3 Always flame the tips of the tube before you insert the loop and after withdrawing the tube. 5.4 The plug after removal must be kept in hand. Never place the plug on the work surface or touch it to anything except the lamed lip of culture tube. 5.5 Do not dip the needle into the agar while inoculating slant. 5.6 Never leave the culture tube open for the longer time than the time needed to transfer the culture.